Okay, so what is the ABS Journeyman Bladesmith Performance Test, and why am I talking about it on a blog about homestead farming? Well . 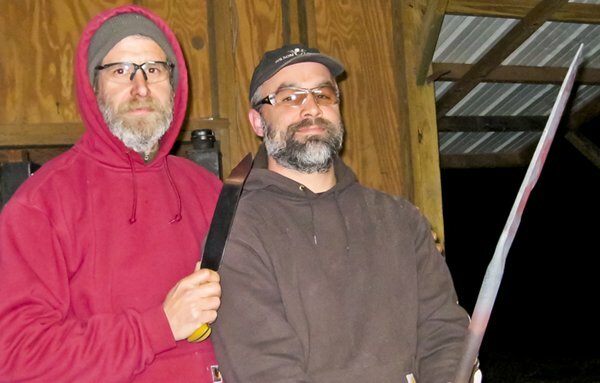 . . Scott (my husband and Bluefield Acres partner) is an aspiring bladesmith. 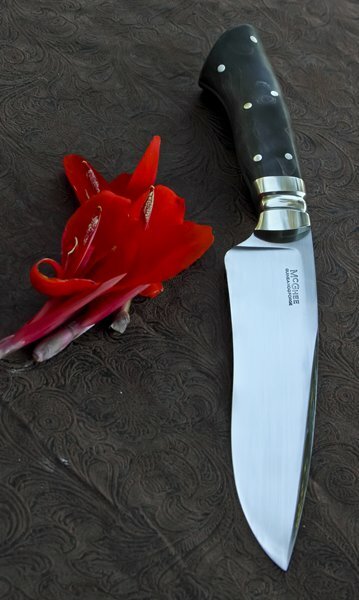 He forges beautiful, high-performance knives out of carbon steel. 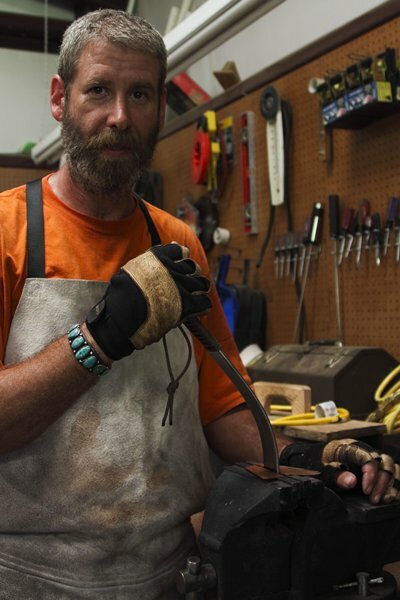 He is a certified arborist by trade, but wants to bladesmith full-time. 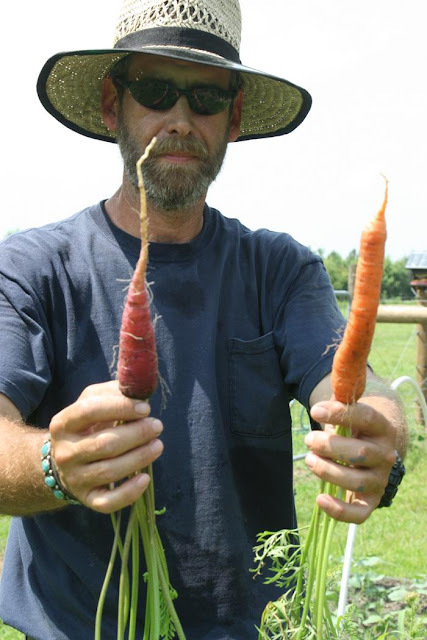 He desires this to satisfy his inner artisan, but also so he can work at home and tend to the farm. Scott currently works in an urban area about an hour from home, and the garden suffers in his absence. While I do well with animals, I do not speak plant. 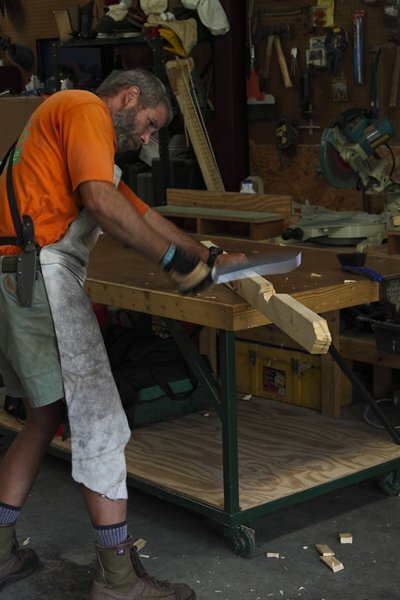 With Scott at home bladesmithing, our garden and orchard will flourish, but there's a hitch - the knives must sell, and for that we turn to the ABS. 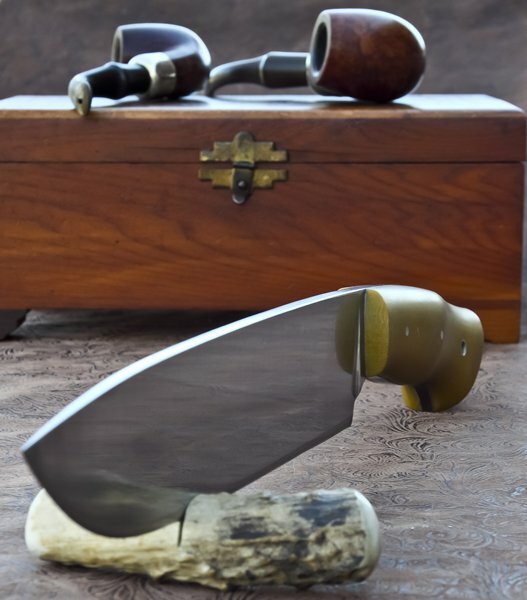 The American Bladesmith Society (ABS) is a non-profit organization that promotes the art of bladesmithing and certifies journeyman and master bladesmiths. 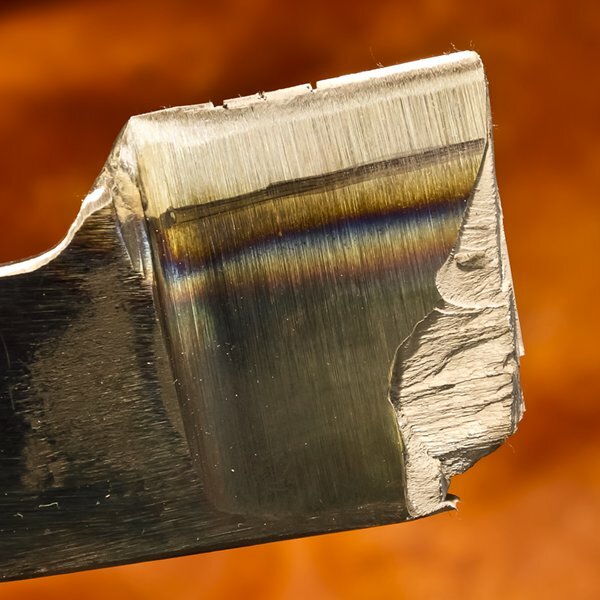 The certification process is very rigorous; candidates must apprentice for three years and pass two tests - a performance test (prove you understand steel well enough to create a performance blade) and a beauty contest (prove you can craft a functional work of art). 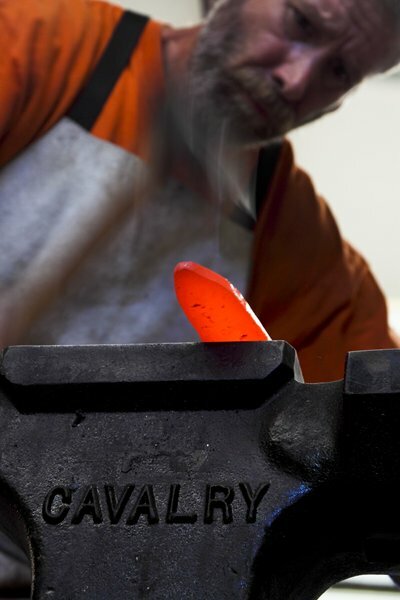 Last weekend Scott demonstrated his knowledge of metallurgy by acing the performance test. 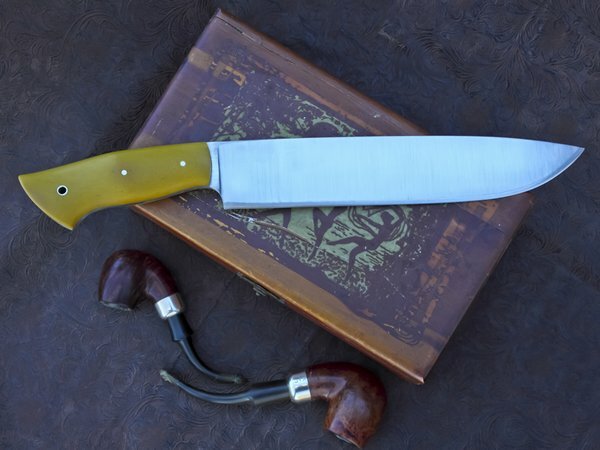 In 2012 he will show his work to a panel of mastersmiths, and, if they give him the journeyman stamp, Scott's marketability as a bladesmith will rise substantially. Two years later, if he passes the master bladesmith exams, his marketability will rise once again. So, the following is a post about Scott's journey to become a fulltime bladesmith and, as a result, a more committed gardener. If you enjoy traditional arts, we hope you will enjoy what you see here. More info is available at Guinea Hog Forge. 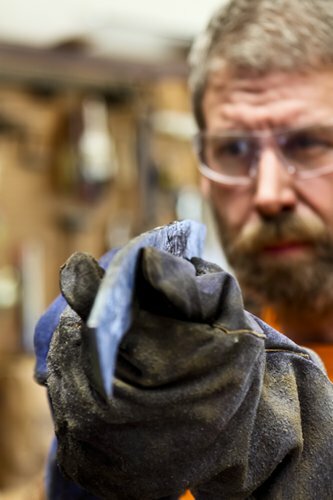 When it comes to making knives, bladesmith E. Scott McGhee suffers from a rather severe case of obsessive compulsive disorder. In preparation for his official ABS Journeyman Performance Test, Scott forged and destroyed four practice knives - one in July, one in October, and two last week. Scott recently forged three knives - two practice blades and the candidate. All three blades were forged at the same time, and then heat treated separately. Scott set aside the nicest one, then ground out the other two and put them through the paces. The following photos are from the test he did in July (I didn't photo the most recent tests), and you can view videos of these early tests by following this YouTube link. 3. Without sharpening, demonstrate that the knife still shaves after after completing tests 1 and 2. 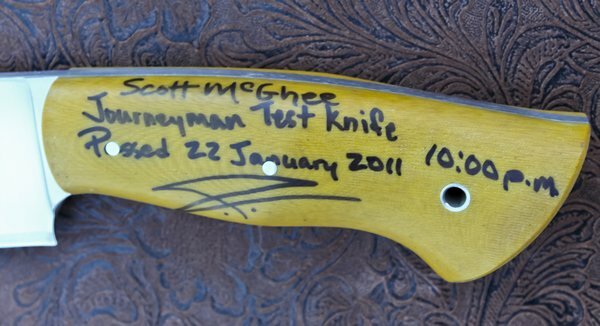 All of Scott's practice knives have passed with flying colors, and the most recent ones were brutalized. One suffered the 90 degree bend test four times before breaking, while the other blade went to 90 degrees twice, then broke after being pushed to 135 degrees. That, however, was simply not enough torture. Scott gathered up the remains of the knives, wacked them on steel angle iron for a while, then on each other, and finally snapped them in half to examine the grain structure. Proceed cautiously, the following pictures are somewhat disturbing. Yes, he meant to do this and for good reason. The performance test proves that a bladesmith understands edge geometry and how to produce tough, flexible blades. Breaking the blades into pieces demonstrates why these knives are so spectacular. What is evidenced in the following picture is extremely fine grain structure produced by the bladesmith during the heat treating process. Making these knives is difficult; the real trick, however, is successfully passing the performance test in the presence of an ABS Master. Feeling cautiously confident that the remaining knife would survive the official test, Scott finish ground the knife, crafted a micarta handle, let me snap some photos, and then drove down to South Carolina for a date with ABS Mastersmith Jason Knight. Almost too pretty to destroy. Upon arrival, Jason informed Scott that the test rules had recently changed. 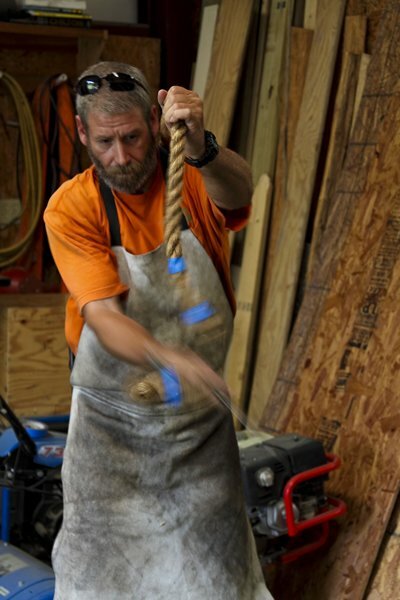 While the manilla rope test was essentially the same, candidates would now be required to chop through a railroad tie twice and bend the blade into a circle to pass . . . Jason has a wicked sense of humor. The candidate passed with no issues - notice that the knife didn't even crack during the bend test. Scott is now one step closer to his ABS Journeyman Blademith goal. 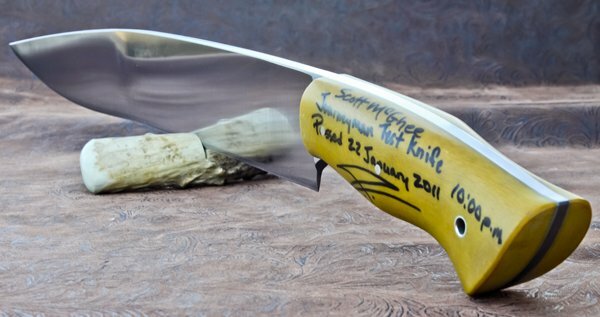 Unfortunately he has another year as an apprentice, so it will be June 2012 before a panel of mastersmiths at Blade in Atlanta will determine whether he receives the journeyman stamp. 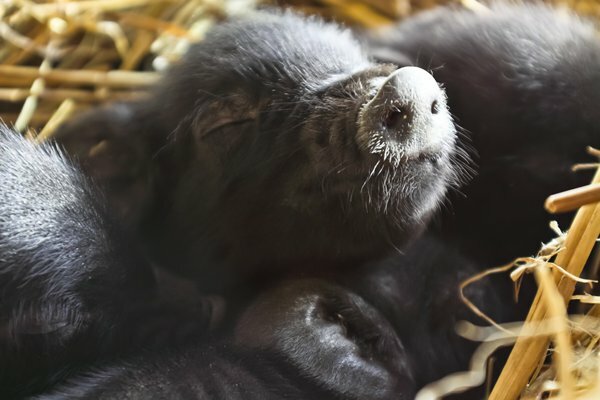 Magnolia waited for the snow to melt before having her second litter. I can't blame her, it's been really cold lately. 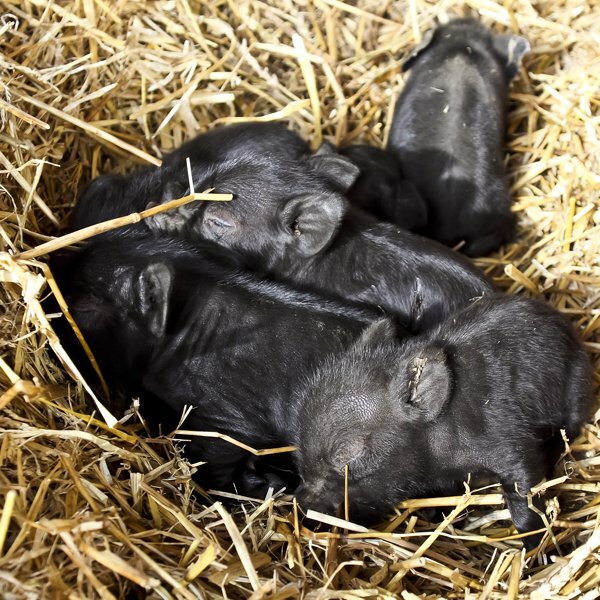 Six new Guinea Hogs were born on December 29 in 20-degree weather, and the poor dears had to burrow in the hay all day just to stay warm. 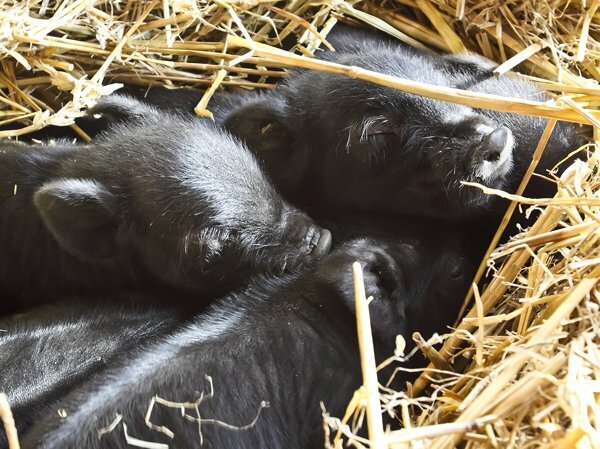 Thankfully, the weather warmed up considerably over the next week, and the new arrivals have been exploring their pen and enjoying the sunshine as much as possible. Magnolia is a girl makin' machine. She had 4 girls and 2 boys this time. We have Dancer, Prancer, Comet, Cupid, Donner . . .
. . . and Rudolph! Actually, you can name yours anything you want! There are 2 girls and 1 boy still available, and they can leave the farm as early as February 9th.